Is there a better alternative to QuickTerm? Is QuickTerm really the best app in System category? Will QuickTerm work good on macOS 10.13.4? 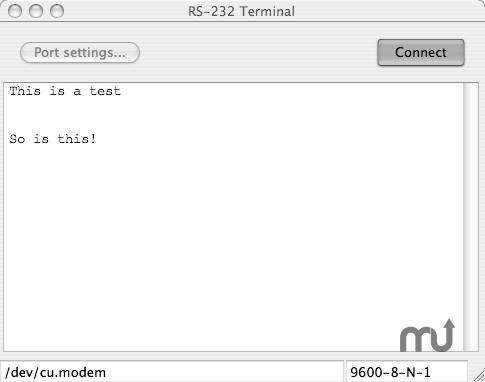 QuickTerm is a basic ASCII terminal emulator. It can use any attached serial port, whether built-in or installed using an adapter such as a Keyspan USB-to-serial adapter. It allows full setting of serial port parameters, with or without handshaking. The name QuickTerm alludes to the fact that I developed it quickly, forsaking features I don't need to get a decent serial terminal emulator up and running. Resolved an unused feature in the NIB file which prevented compatibility with OS X v10.2. Added 110 to baud rate drop-down list. QuickTerm needs a rating. Be the first to rate this app and get the discussion started!